From the Full Press Release: "The U.S. will finally get to see Matt Smith, the youngest Doctor ever and the 11th incarnation, as Doctor Who returns on BBC America, the network announced today. The BAFTA-winning drama will make its U.S. premiere on Saturday, April 17, not long after the U.K. broadcast." The BBC Press release also said: "Doctor Who, BBC AMERICA's highest rated series ever, continues its tradition of rebooting with new lead actors and creative team. 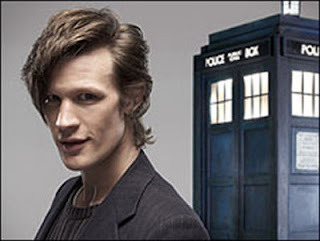 Matt Smith debuts as the new, Eleventh incarnation of the famous Time Lord alongside a new traveling companion, the enigmatic Amy Pond (Karen Gillan). Traveling both through time and space, the new series has the mysterious Doctor and Amy Pond together exploring sixteenth century Venice, France during the 1890s and the United Kingdom in the far future, now an entire nation floating in space. The first three episodes of the 13-episode series have been confirmed as The Eleventh Hour, written by Steven Moffat, The Beast Below, also by Moffat and Victory of the Daleks by Mark Gatiss." It's great news to see that this will be getting an American audience, without having to download it via the internet!